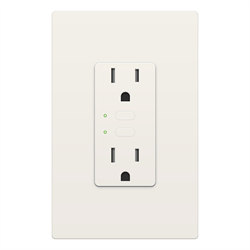 This dual band INSTEON receptacle has BOTH outlets individually controlled by Insteon remotes or automation controllers or at the receptacle using the manual on/off buttons. Tamper-resistant receptacles help protect against potential electric shock and meet newer code requirements. When combined with a compatible controller like an Insteon Hub you can enable scheduled times for the outlets to switch on and off, remote control ability as well as alerts in case something gets turned on. You can also use an Insteon handheld remote control or in-wall keypad to control the outlets. The load sense circuitry lets the module turn itself on in case the plugged-in device is turned on-off-on, making it more convenient when used with certain loads like stand up or tabletop lamps that might need to be manually turned on when the receptacle is hidden behind furniture. Of course, as an Insteon device, the Insteon Receptacle can be part of custom lighting scenes so a single remote button press can turn on multiple devices just the way you need them. 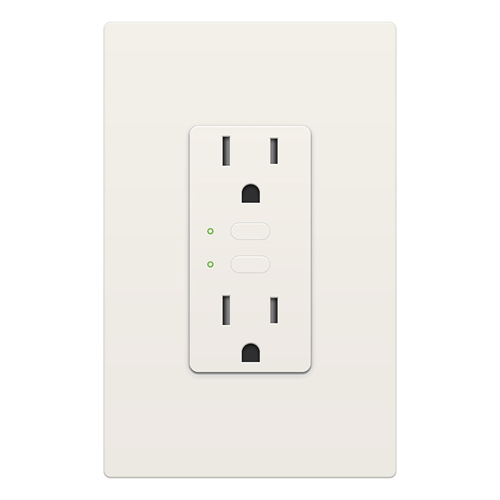 Note: As of 10/30/2015 we have been made aware that the bottom outlet cannot be controlled by the Insteon for Hub app for Android or Windows. It works fine with iOs and via ISY automation controllers.